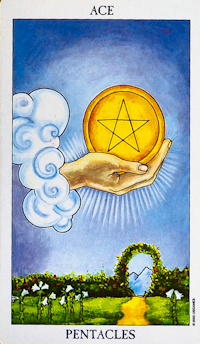 Ace Of Pentacles. Tarot. Free Tarot. Free Tarot Reading. The Hand of God is holding the pentacle as an offering to those who will learn to grasp its meaning. It seems to suggest that all may partake of material goods and reach the mountain of attainment after recognition that the universal consciousness is offered to all who seek it. The lilies in the foreground represent purified desires. The roses represent the energetic drive behind the desires of the flesh. The twin mountains of attainment, seen through the arch of roses, indicate that the goal is in sight although still in the distant future.